This article first appeared on the Cottage and Country Home Plans web page under the title, "A $10 Woodshed"
This shed was built from these plans by Ted from Montreal.Spring is the best time to build a wood shed, when the importance of having one is still fresh in your mind and when a whole summer's drying time lies ahead. 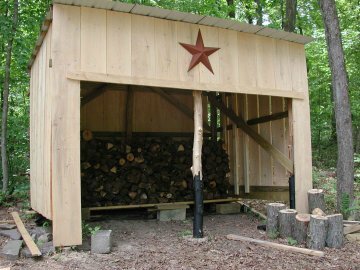 A wood shed is also a great first project for the novice carpenter. It is not usually subject to building codes or permits, nor does it require a great investment in time or money. Use the following plan and instructions only as a starting point. Simply heed the following design principles, then plunge in with your own expression of the wood-butcher's craft. Be creative with materials that you have on hand. 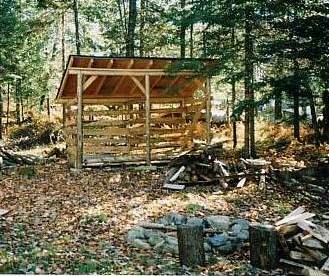 There are only three main design factors in the creation of a good wood shed: shelter, ventilation and access. If your design makes provision for these factors, it will work. It also helps if you design it into half-cord sections. This allows you to easily keep track of the amount of wood you consume, or have delivered. A cord of wood is the amount of wood, loosely stacked, occupying a volume 4' x 4' x 8' - the adjacent design will easily hold one full cord. For proper stock rotation, use up one section completely before starting on the next. That way you won't end up with all your seasoned stuff at the back, buried under a new load of green wood! The basic post and beam framework for this wood shed took less than one day for one person (with occasional assistance) to erect, and cost less than $10 in materials for the framework. This shed was built by David from Pennsylvania. Looks like more than ten bucks worth. Making use of small diameter (6") logs from your property or the beach will save money and provides that genuine rustic look. First, peel the bark from the logs to eliminate bark beetle habitat - use a garden spade or hatchet - and knock off any branch stubs. Make recesses for the posts as shown. The posts are attached to the beam while both are lying flat on the ground. Nail the strapping first to the post then roll the post so that the strapping lies beneath. Next, place the beam on top of the strapping. Bend the strapping up and around the beam and nail to the other side of the post. A half-dozen 1-1/2" galvanized nails will secure things nicely. Raise each post and beam assembly onto foundation rocks, then add bracing till the structure stands rigidly in place. Discrepancies in height can be evened out by packing dirt and sand under the lowest rock, or by scooping out beneath the highest one. The roofing framework is your option. The structure shown uses full 8 foot 2 x 4's, spaced 24 inches apart. They can be covered with plywood or slats, then asphalt roll-roofing or shingles. Or, for a sunny, bright interior, use corrugated fibreglass panels nailed to wavy nailing strips. What else do you have for roofing? Recycled sheet metal roofing? Hand-split shakes. Sheet metal cut from junked car roofs and fridges? 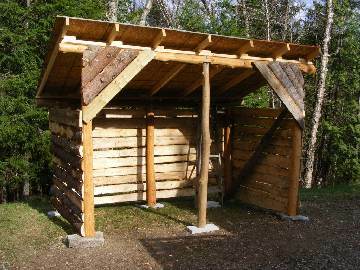 Jean from Montreal built this basic woodshed from these plans. The rustic look is nice.On my roof I dispensed with the 2 x 4's and used slab lumber - that's the lumber produced during the first cut of a log - which I picked up free from a local mini-mill operation. It is curved on one side, and is of variable width and thickness. I evened it all up with wood cutoffs for shims, then covered it with fibreglass sheets that someone was throwing out. I used more slab lumber, split into narrower widths, for slatted walls. Spaced slats, vertical or horizontal, are important to the proper ventilation of a woodshed. Two finishing touches: A layer of plastic on the floor will block dampness from coming up from the ground. And stack the firewood on lumber off-cuts for good air circulation under your woodpile.